In the run up to the crucial festive trading period, a survey of the nation's shopping habits has found that shoppers will not splash out this Christmas because "prudent" spending has "become the new norm". The report by Shoppercentric surveyed 1,000 UK shoppers and found that despite positive news from the Government about economic "growth", 60% of shoppers continue to experience rising living costs, and 14% are facing pay reductions or redundancy. While "the tills will still be ringing" the report says consumers will be employing "money saving" tactics to make cash stretch even further. The report found 28% were not confident in the future of the economy and 44% would keep a tight budget this year as a result. Nearly a third said the economic downturn had taught them to be thrifty, and that they planned to continue shopping that way into the future. Just 9% said they would expect to spend more this year than last year. According to the survey, men also expect to spend more on their partners than women – splashing out £168 on average. Women said they expected to spend an average of £89. The report claims online shopping will continue to rise, with 83% of 18- to 34-year-olds claiming they are "more likely" to shop online than in store and 47% citing a preference for online shopping to "avoid crowds". However, a fifth of all those surveyed said they wouldn’t shop online for fear the present would not arrive in time for Christmas. 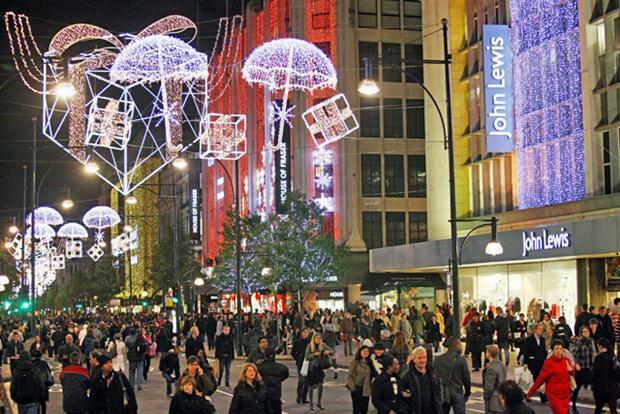 Danielle Pinnington, Shoppercentric's managing director, said: "Retailers and brands won’t be able to rest on their laurels this year and expect the festive spirit alone to work its magic. "It’s a make-or-break season for many businesses and with shoppers looking to squeeze the most value from their Christmas spending and make every penny count, retailers. "Brands will need to earn their custom through keen pricing, genuine added value and by proactively communicating and selling to potential shoppers and consumers at every opportunity." Sainsbury's vs John Lewis: which ad will help deliver the most sales this Christmas?